What happens to an Assassin when his faith is completely stripped away? After a botched mission destroys an entire city, former Assassin Shay Cormac turns Templar in order to enact his revenge in Assassin’s Creed Rogue! Coming out this November, Assassin’s Creed Rogue will be the first game to have a Templar as a lead character! During the Seven Years’ War Shay Cormac was known to be a skilled sea-faring captain, an excellent swordsman and an efficient killer with dual wielded weapons. Our Shay action figure comes equipped with a pistol, air rifle, and sword! As the lead assassin in Assassin’s Creed Unity, Arno Dorian always needs to be prepared for every combat situation in Paris, France! Equipped with an outfit designed by award-winning artist Todd McFarlane, this new version of Arno is ready for anything the French Revolution can throw at him! Arno also comes with an ornate one-handed sword, only wielded by the most dedicated Assassins! Our figure of Arno also includes a pistol. When danger hides behind every corner in the Parisian streets, Assassin Arno Dorian has a unique advantage over each opponent he fights. Blessed with a rare sixth sense, Arno is able to pinpoint even the most cunning enemies with his “Eagle Vision” ability! When activated, Eagle Vision instinctively shows his enemies and allies in a variety of different colored glows, as well as a blue glow for Arno himself. 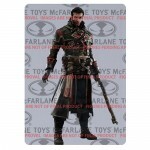 This is the first time ever that McFarlane Toys has created an Eagle Vision Assassin! Arno is equipped with a pistol and French sword! This figure will be available exclusively at Walgreen’s! Check out the preliminary images of Shay and Arno by reading on. No photo is available of Eagle vision Arno at this time. The pics come courtesy of sponsor Entertainment Earth.